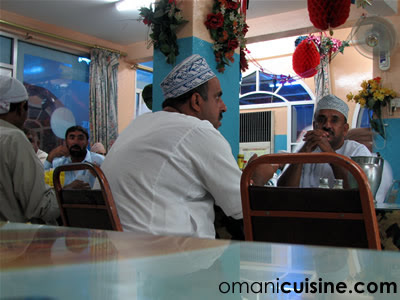 You cannot claim that you have lived in Seeb if you have never dined at Dosteen Restaurant [Ù…Ø·Ø¹Ù… Ø¯ÙˆØ³ØªÙŠÙ†] (Pronounced Dos’tain)- a random generic Indian restaurant that survived throughout the years and managed to hold itself as an era defining landmark, the same way Burj Al Sahwah and Bait Al Barakah do. Nobody I know knows when this place was first opened, I wouldn’t be surprised if it was opened in the 80s or even earlier. Dosteen faces the highway between the Al Khode and Al Hail bridges and is located almost exactly opposite Al Itihad used car showroom. Before we start, I would like to warn you that Dosteen is certainly not for the weak-hearted or the mysophobic. It is one of few places left on Earth that still serve water in metal glasses just like Indian movies – however, they have recently started offering plastic cups for the picky and dandy. Dosteen is relatively large in comparison to restaurants of its class, it has an isolated area for families (I do not know who dares going there), an air-conditioned dine in area, and a covered yard with some more tables. It is usually very crowded most of the time, it is normal for people to stand waiting for seats to be available when coming at peak hours. Tables are usually shared in both the outside and the inside seating area. 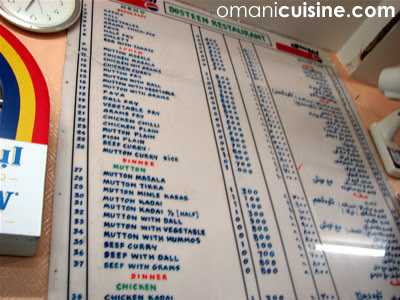 I don’t think that there is a handout menu in Dosteen, but there is one walled with the names of the dishes in Arabic and English – for some reason, the two sides of the menu are not the same and some dishes went missing in one or another. However, Dosteen serves 48 different wonders of the Indian cuisine. 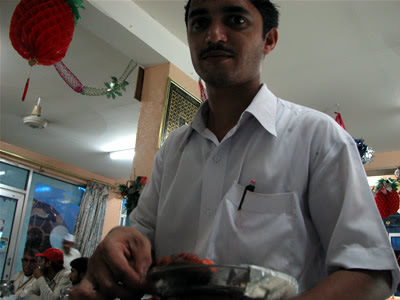 The majority of which are served with rice, naan bread, or chapati bread. Complimentary salad is served with all the dishes. Even though Dosteen is equipped with a fleet of Indian cooks, waiters and cashiers, the waiters always seem very stressed and can be moderately rude if you cannot quickly decide what you want to eat or if you change your mind, and that, of course, adds to the ambiance of the place. The funny thing about Dosteen is that their food is actually good, there are people that swear by its food and occasionally crave for a meal at Dosteen. 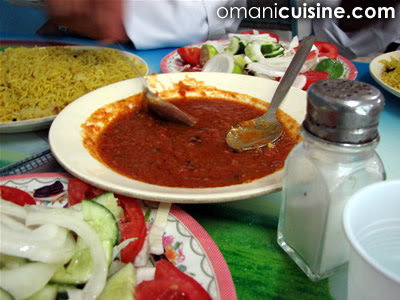 I had a chicken masalah (not photographed) which was spicy the way I like it and pretty good. 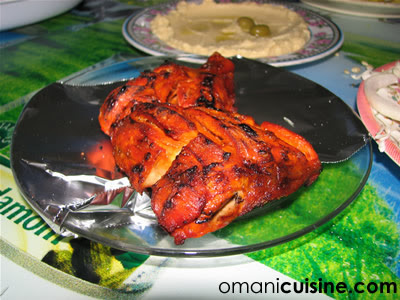 We ordered other stuff like grilled chicken, humus, and rice with grilled meat cubes. The average price of a dish at Dosteen is RO 1, I think that the a soft drink can costs a RO 0.100. There isn’t much else that you can order here. 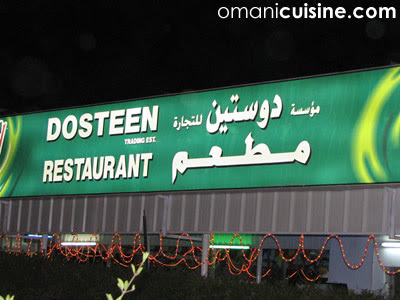 Dosteen is no fancy place, but if you are looking for a different place that has so much attitude, culture, gangster-like atmosphere, and good Indian food then Dosteen is the place to go to.